Photographing our natural satellite can add a new dimension to your photography skills. But how and when should you photograph the Moon? The Moon is one of nature's wonders, but to photograph it successfully you first have to understand it. Although astrophotographers specialising in the Moon usually photograph it through a powerful telescope, a telephoto lens of almost any focal length is good enough to get a good Moon shot. Making the Moon the sole focus of a shot, however, is only one way to approach lunar photography; another is for it to enhance a landscape photo, where it can provide a powerful addition to a wide-angle image. The equipment you’ll need is the same as for landscape photography: a DSLR, mirrorless or bridge camera on a sturdy tripod, and either a wide-angle or any regular telephoto lens, such as one with a 70-300mm focal range. A remote shutter-release cable will also be useful so you don't introduce vibrations, although you can also use the timer in your camera. The Moon is a moving target; the combination of Moon's 2,288 miles-per-hour orbit and Earth's 1,000 miles-per-hour rotation makes our satellite a fast-moving target. However, it's usually bright enough for a relatively fast shutter speed to yield good results. Although you can autofocus on the Moon as it rises, or as it becomes visible just before sunset, it's a good idea to focus manually. With your lens set to manual focus, set the the focusing ring to infinity. It takes some practice since most cameras can focus beyond infinity, and finding the exact point that works for your lens takes trial and error. Take some test shots and zoom in on the result on your camera's LCD screen to see which one works best. Don't skip this step; only once you've done it correctly will your Moon photos be reliably sharp. Don't overexpose the Moon – it's much brighter than you probably expect. However, it does depend on whether you're just photographing the Moon, or whether you also want a foreground. To get a great Moon shot and little else, set your camera to ISO 100 or ISO 200 and the aperture to between f/5.6 and f/11, and adjust your shutter speed to between 1/125sec and 1/250sec. The exact settings will vary depending on your camera and the brightness of the Moon, which depends on its exact phase, but these base settings will get you started. Taking a landscape photograph that includes the Moon is more difficult because during that 'blue hour' after sunset the Moon is already too bright. So, if you take a longer exposure for the landscape, you'll overexpose the Moon, and if you expose for the Moon, the landscape with be under-exposed. So what do you do? The answer is either to photograph the Moon just before sunset when the light levels are higher (they drop-off so quickly at the point of sunset), or to take two exposures and combine them in photo-editing software. The latter approach, however, often looks fake. Another way is to expose for the Moon, and use a flash to light the foreground. Some photographers will tell you to always photograph a Full Moon, but that's an amateurish mistake. Not only is the Full Moon's glare a real challenge to overcome, but a perfectly Full Moon is also visually uninteresting. It's a cliché. Instead, go for other phases of the Moon when you can see a line between the light and dark sides. This is called the terminator line, which is when the craters on the Moon throw shadows, particularly near its South Pole. You can see this most nights, but perhaps the most precious kind of Moon is visible only on the few days on either side of New Moon. At this time, you'll also see a waxing or waning Crescent Moon close to the horizon, and it comes with the bonus of Earthshine. Although 50% of the Moon is constantly being illuminated by the Sun, there are a few days each month when the Earth gets involved – and it's a beautiful event to capture. Earthshine is a dull glow to the unlit area of the Moon that's the result of sunlight reflecting off Earth's surface and on to the lunar surface. Its subtle and mesmerising, and easy to capture if you time it right. Set up for the first (or, more likely, the second) sunset after New Moon. Using a lens with as long a focal length lens as possible, and with your camera on a tripod, dial in a sensitivity of ISO 400, an aperture of f/2.8 (or as low as your lens will go), and open the shutter for between one and four seconds. In fact, Earthshine is always being reflected onto the Moon to some extent, but it's only around New Moon that the crescent of sunlight is small enough for the camera to expose for both the lit and unlit areas. This is also a good time to combine Moon photography with night-sky photography because the Moon will set soon after you've photographed it. You can then go looking for stars and the Milky Way. There are two exceptions to the advice to avoid photographing the Full Moon. The first is when there's a total lunar eclipse, and the second is when a Full Moon as it rises or sets, as it's a great alternative to a sunset. The sight of a Full Moon peeking above the horizon and turning from deep orange to pale yellow to bright white during twilight is a spectacular sight. It also presents an opportunity to get the Moon in the context of a beautiful landscape. The colourful spectacle lasts mere minutes and is easy to miss, but, like everything else in the night sky, a rising Full Moon is predictable down to the second. Simply find out exactly on what day the next Full Moon is going to be where you are, and exactly what time sunset is on that date, then look to the east for the moonrise. Start-off with your camera set to ISO 100, f10 and 1/125. If you've ever seen photos of someone or something silhouetted against a seemingly giant Moon, perhaps while standing on top of a hill, they were taken during a moonrise. They were also ruthlessly planned; The Photographer's Ephemeris and PhotoPills apps are ideal for this kind of project. To make the Moon look so large in the background, photographers need to use superzoom telephoto lenses of at least 1,000mm while being positioned a mile or so away from the all-important foreground subject that introduces that sense of scale. It's possible to shoot the Moon and add it to another landscape shot using Photoshop. However, almost everyone who attempts this either makes the Moon look way too big, or they place it somewhere in the night sky that it doesn't occur (such as in the norther hemisphere's northern sky). To anyone with a trained eye, most composites look like what they are: fakes. There is one exception; moonstacks, a lunar time-lapse, in which you take several photos of the moon as it moves through the sky, and then use Photoshop to composite them into a single image. 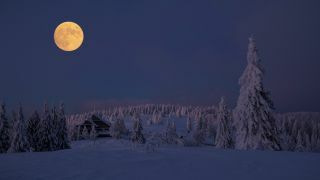 Although it often grabs the attention of photographers and media alike, pay little attention to the term 'Super Moon'. A recent term that merely means that the Moon is slightly closer to Earth than normal, it has little practical meaning or use. However, while a Super Full Moon does look larger as it rises above the horizon, it's only by about 10%-15%, so it's barely noticeable to eye or camera. The very finest way of getting a close-up shot of the Moon – and the only way to get enough magnification for it to fill the entire frame – is to mount the body of a camera on a telescope using a cheap T-adaptor; it's like having a very large telephoto lens. Try to find a telescope with a focal length of over 1,000mm, but under 2,000mm to capture the whole of the moon. Whatever kind of Moon-shot you try for, photographing our satellite provides a good lesson in the role of precision timing in composing unique landscape and nature images.